This .308 Winchester ammunition for M-14s, FALs, and other .308 rifles delivers excellent performance on the range and in the field with a 140 grain soft point bullet. 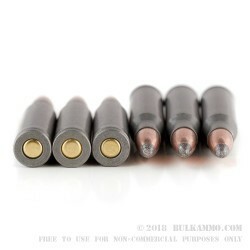 These rounds produce good expansion against deer and other game while avoiding fragmentation and remaining cost-effective thanks to their economical steel cases. 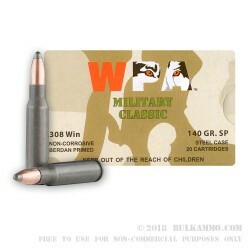 These cartridges are manufactured in Russia and imported by Wolf Performance Ammunition. They use non-corrosive Berdan primers. 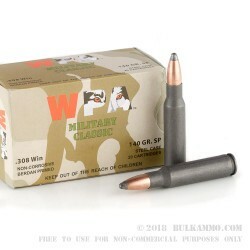 Stock up with this 500 round case at Bulkammo and enjoy great volume savings! Each case contains 25 boxes of 20 rounds each. 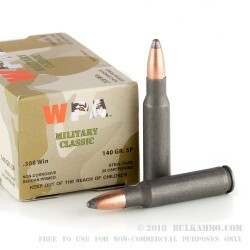 Q: Is the wpa military classic .308 ammo bi-metal or non-magentic. A: Hello James, This ammunition is loaded with bi-metal jacketed bullet. Q: what are the fps this round produces ? A: Hello David, The noted velocity of this ammunition from Wolf is 2760 fps.